At Mighty Well, we know firsthand the difficulties of not only managing a medical condition, but overcoming the obstacles of trying to live a normal life with one, too. There have been times in my life when just leaving the house for an afternoon has required a ton of mental and physical preparation. On my better days, I’ve learned the in and outs of managing my health during a vacation or a trip for work. Regardless of where you are in your healing journey, heading out for any adventure can take some work. In our own lives, we’ve struggled to find the perfect solution to carry and organize our medical supplies, especially when traveling with a chronic condition. 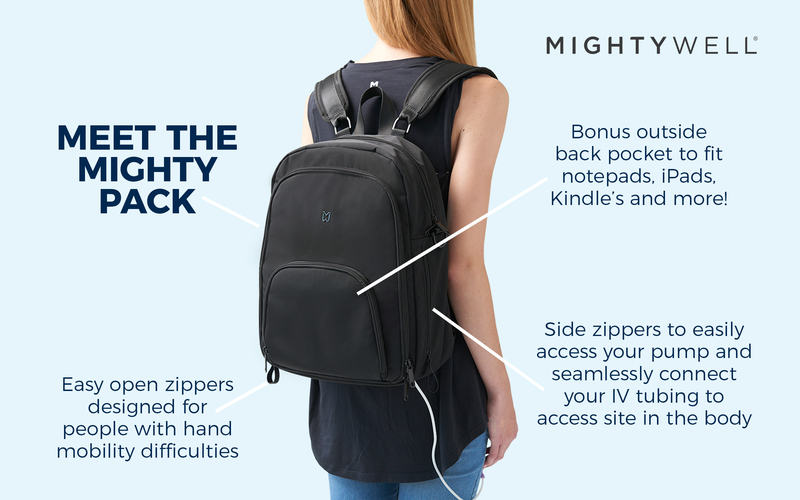 That’s why we created The Mighty Pack, the first medical backpack to be designed for patients, by patients. It’s the pack that we wish we had had ourselves! 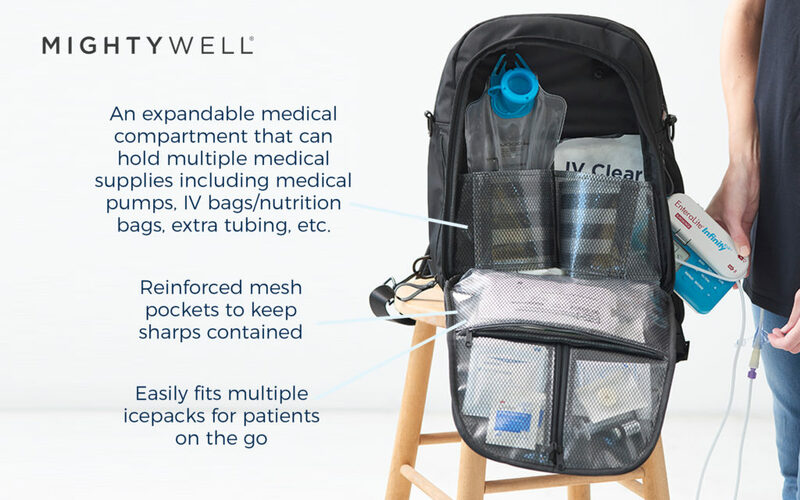 The Mighty Pack takes some of the stress out of organizing and toting around medical supplies, including IV bags, pumps, diabetic supplies, extra tubing and more. And if you have medication that needs to be refrigerated, like insulin, the Mighty Pack can help you there, too! We’ve dealt with these struggles in our own lives, so we didn’t overlook any part of the Mighty Pack, even the smallest detail, like easy-to-open zippers, to make sure it’s an all-in-one solution to traveling. This backpack is the perfect medical equipment bag to carry all of your supplies and medications. The placement of the side zippers around the expandable medical compartment give you easy access to your supplies and seamlessly connects your IV tubing to the access site on your body. These features make travel convenient for tube feeding and enteral nutrition patients, diabetic patients, and anyone else who needs to carry around medical supplies. If you’re anything like me, you find yourself hurriedly shoving all of your supplies into a bag while you’re packing for a trip or running out the door. 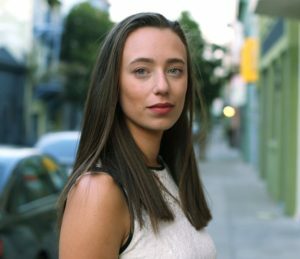 Brain fog is real, and forgetting where you stored something, or even forgetting to pack it, can add to the stress of leaving home. This pack is thoughtfully designed with that in mind, making it easy to not only pack, but find, everything you need, no matter where you may be. The insulated pockets can hold ice packs, making traveling with cold medications and food a breeze and take some of the stress out of leaving the house for an extended period of time. Its durable fabric and reinforced pockets will keep your supplies organized and protect you from any sharp pieces, while the easy-open zippers were designed for those with hand mobility issues. The Mighty Pack’s padded straps make it comfortable to wear all day. Use a wheelchair? 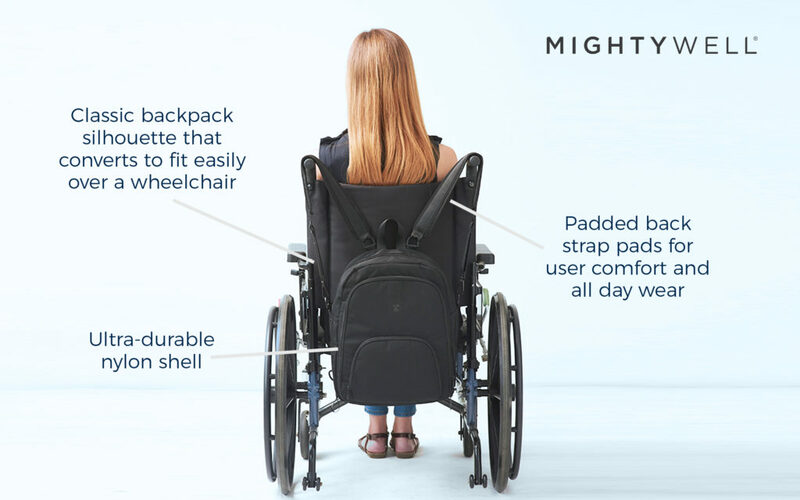 Not a problem, the Mighty Pack is designed to easily convert to fit over the back of wheelchairs. 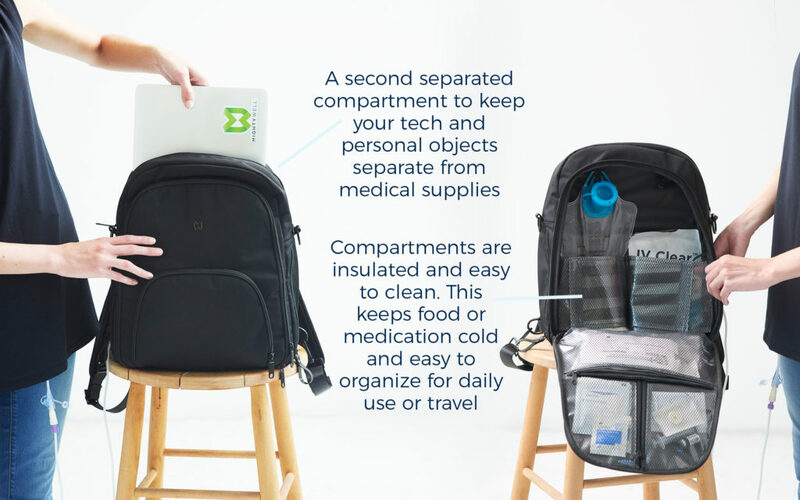 An additional compartment stores your personal items, like iPads, books, work or school documents, and more, separate from your medical supplies, so you only need to pack one bag when heading out on a day trip. And we hope that one day that personal compartment will be all you need! The Mighty Pack was designed to help you throughout your entire health journey. The medical compartment is expandable so it’s there for you when you need it, but if the time comes when you don’t need that any more, your Mighty Pack can still be your “go to” bag. Living with a chronic illness or condition will no doubt change your life, but that doesn’t mean you can’t live the life you want. We are on a mission to create products that will give you the freedom to do the things that you love, and the Mighty Pack was designed to do just that. Want to find out more, or get a backpack for yourself or a loved one? Click the button below to shop now!